Ok, so what happened just recently this summer? Ladies and Gentlemen, you all were lucky enough to experience moment of history. 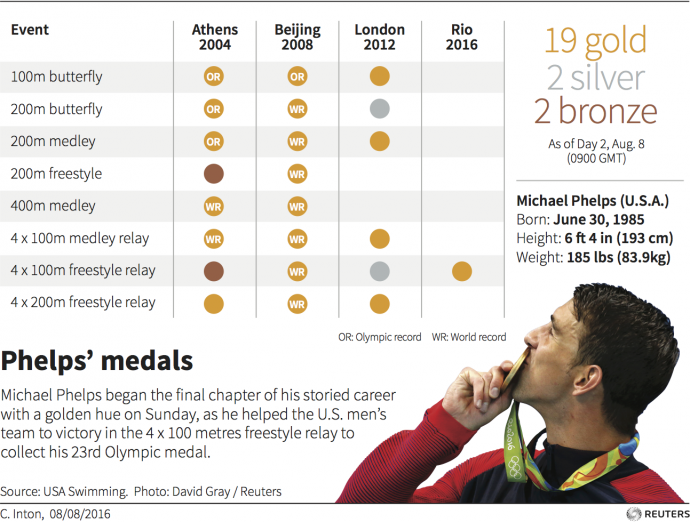 Michael Phelps, who already was the most decorated Olympian in history, just set the new record mark for gold (and not only medals)! The Baltimore Bullet now has 28 Olympic medals total (and countless more from lower-level championships), 23 of them are gold. And in Rio Olympics, he won 5 gold and 1 silver. Not bad for a ‘retired’ 31-y.o. swimmer who decided to quit his sports career back in 2012 but did eventually come back. Although it’s very unlikely this record will be beaten anytime in the next 100-200 years, let’s talk more about how things like this could happen. The thing is that swimming discipline in Olympics includes a number of disciplines even if you specialize in 1 style – freestyle for example. Sprinters can compete for 50m, 100m and maybe even 200m (not very common, though) – best swimmers can get 3 golds from one Olympics. Phelps is a universal swimmer that allowed him to score that many medals (Beijing 2008 is a perfect example). 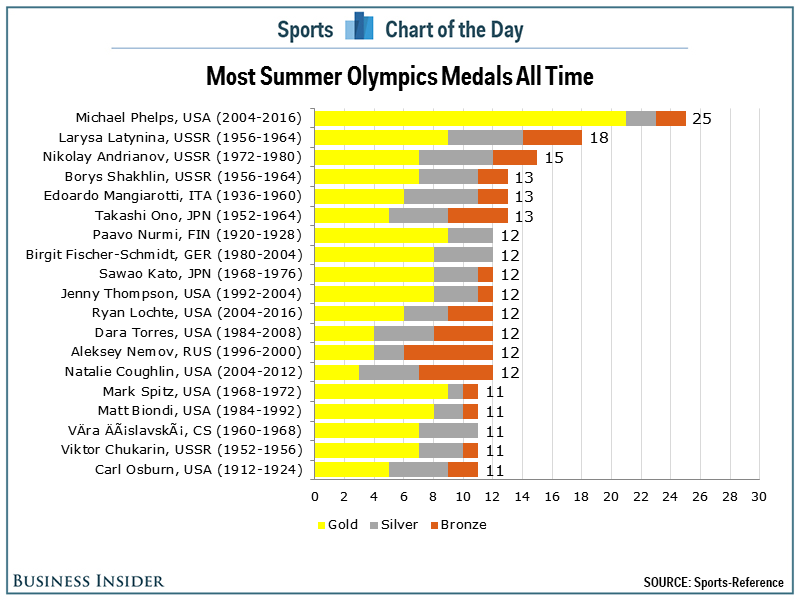 So it’s very likely that even someone will ever beat that record, it will also be a swimmer. Let us know your thoughts in comments! Swimming is not always leading to losing weight. You can see an example of Grant Hackett who even was mentioned in our Heroes section, but he doesn’t look very fit, right? Because any person who can swim 10k shouldn’t automatically look like a Superman. However, there are ways to lose weight for swimmers. Of course, even considering that swimmers burn calories like no other athletes, if we consider amateurs, with workout of 1 hour in length, the results will differ very much than those of Michael Phelps. Many people enhance their diet with supplements that provide faster result. HCG drops is one of great examples, but you need to know how to choose the real ones and where to buy them, which is probably the most important part. Things like this help to achieve your weight loss goals faster and more effectively. Now, this topic is not directly connected to open water swimming, but rather a more general overview for broader audience. Many people know that swimming improves your health, helps to manage weight and is just a fun physical activity. That’s just common sense, and we don’t really put a lot of thought into this. But, how exactly does it help? Many open water races do not have officials overseeing much of the course with the exception of the start, major turns and finishes. In these cases, among the most competitive swimmers, almost anything goes…and almost nothing is called and no one is disqualified. Referees in an open-water swim race. However, in most open water swims, a very large majority of athletes compete in a courteous manner and only inadvertently cause problems for other swimmers. At the highest levels of the sport, whether it is a men’s race or a women’s race, at least 25 swimmers will swim in large tight packs, each close enough to touch each other. During these tight races, arms frequently get tangled and legs get pulled in the midst of a lot of kicking, thrashing and splashing. Swimmers can get kicked, elbowed, bumped, pulled, banged, kneed, cut off, scratched and jostled at the turns, feeding stations and finishes. 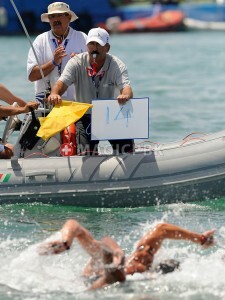 But, it is the responsibility of the referees to maintain order and fairness during the races. When are whistles blown? When are fouls, yellow cards and disqualifications called? Under the established FINA rules of open water, there is a head referee, two assistant referees, turn judges and feeding station judges who are responsible for the race fairness and should be in constant contact with one another via hand-held radios.